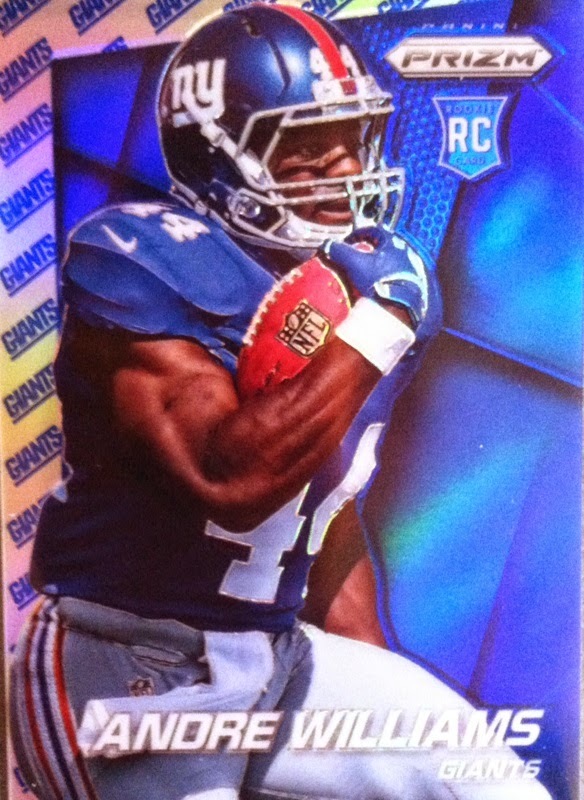 2014 Sport Card Collectors Panini Player Of The Day Promo Part 4: WIN A Hobby Box of 2014 Prizm Football! Click on this image to go to the POD website and check out all that POD has to offer!!! Welcome! For the third year in the row Sport Card Collectors has been chosen to host the blogger version of Panini's Player Of The Day. For the next month and a half I will be running a variety of contests for you guys to enter thanks to a prize lot from Panini and a bunch of cards I put in myself. Sounds like fun, huh?! 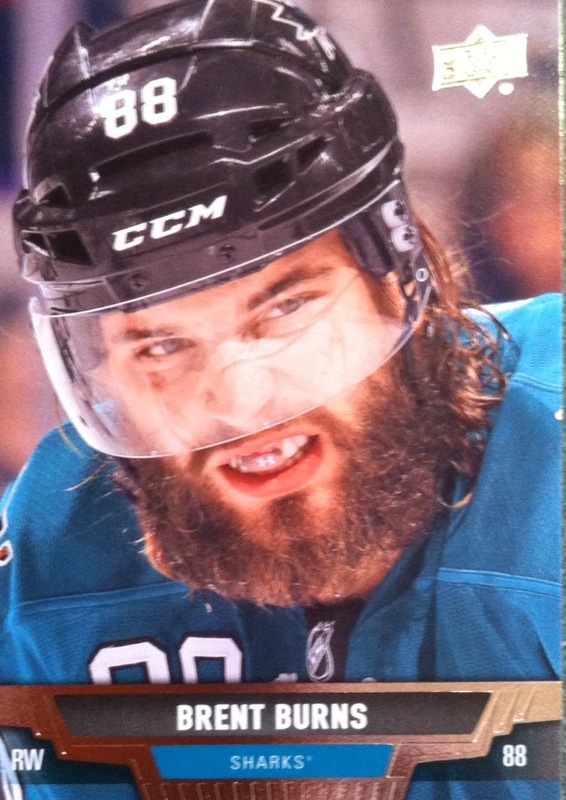 For Part 4 of my Player Of The Day promo (please check out Panini's promo first at your local participating shop! 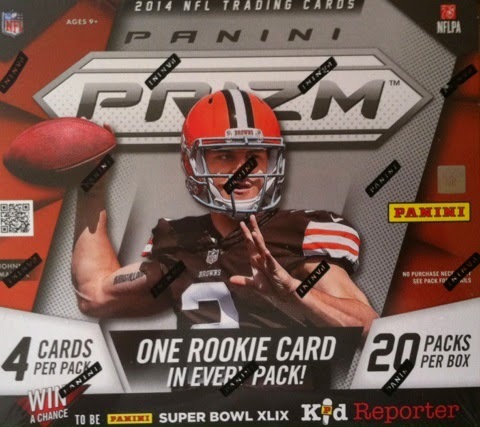 ), I will be giving away this sweet hobby box of 2014 Panini Prizm football. Each box of Prizm has tons of parallels and two autographs. How do I win you may ask? Well, let me tell you! Must be a U.S. Resident to enter...SORRY! Go to this LINK and tell me where the closest participating Panini Player Of The Day LCS is to you and list that shop's name in comments. That is it! Wanted to make some of these contests easier than others! Entries are due by Friday, November 7th 2014 by 8 pm e.t. Winner will be announced Saturday, November 8th 2014. 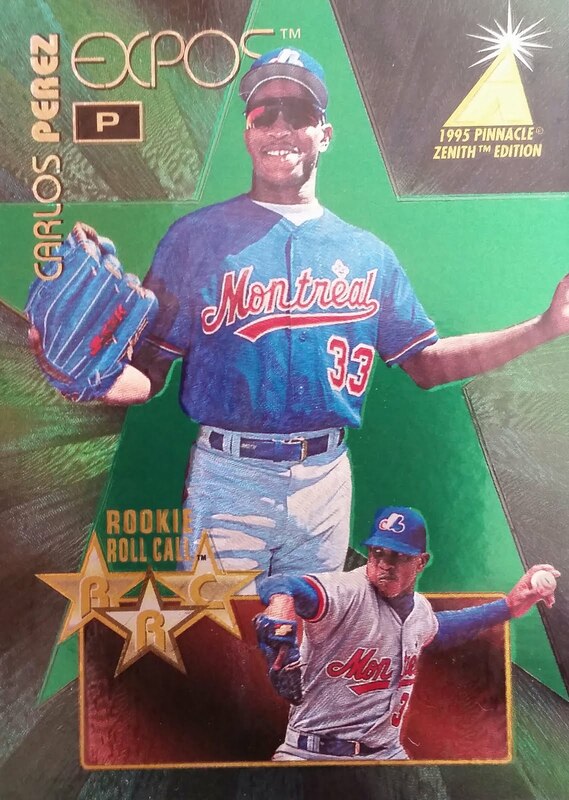 Once again, I really wished Panini had an MLB license. They consistently put out impressive products and this is one of them. Why did I think that about this product, well, you will have to read on! 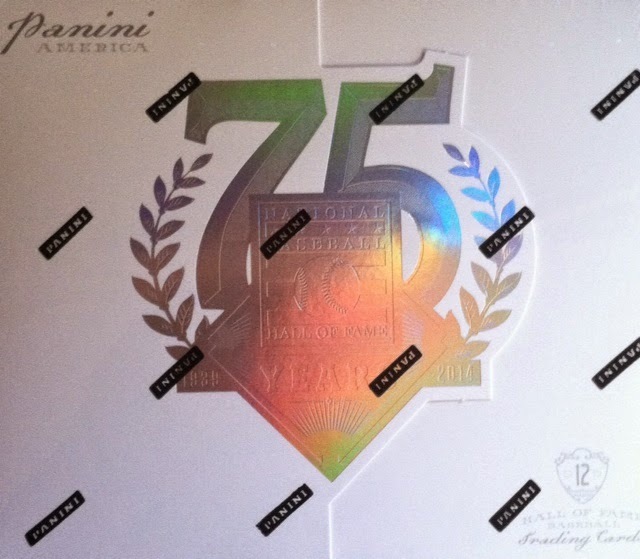 Each box of 2014 Panini Hall Of Fame 75th Year Anniversary comes with 12 cards. In the 12 cards you will find, 2 Hall Of Fame autographs, four base cards numbered to 75 or less, one Elite Series, one Dominator, one Diamond King, one Crusade, and two other cards. You can get all of this for $140. 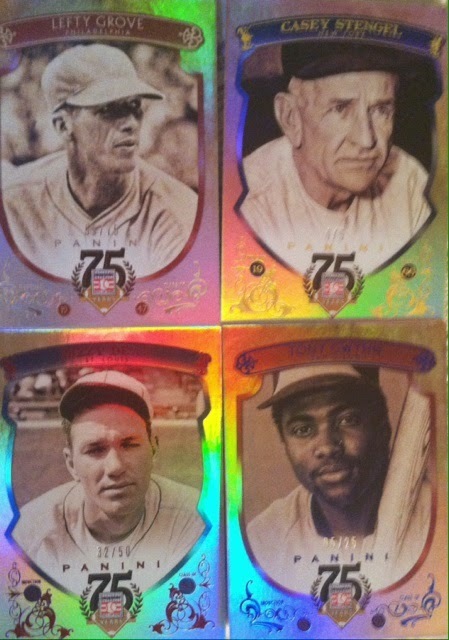 The base cards in 75th anniversary come with three unique versions all numbered to 75. 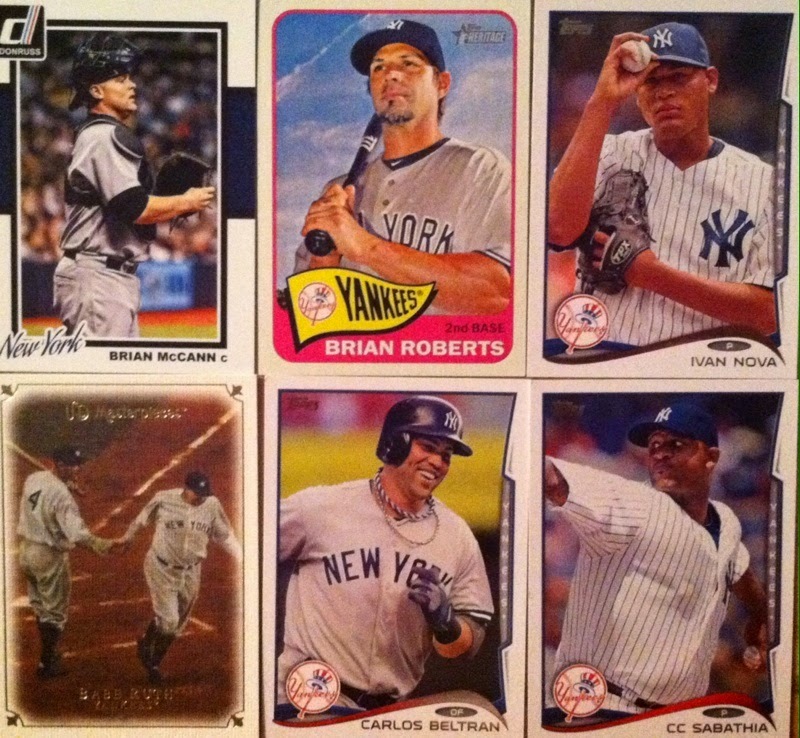 On top of that, each base card will have a 5 types of parallels numbered to 50 or less. In this box alone, I pulled some great ones including a Stengel Gold numbered to 5. 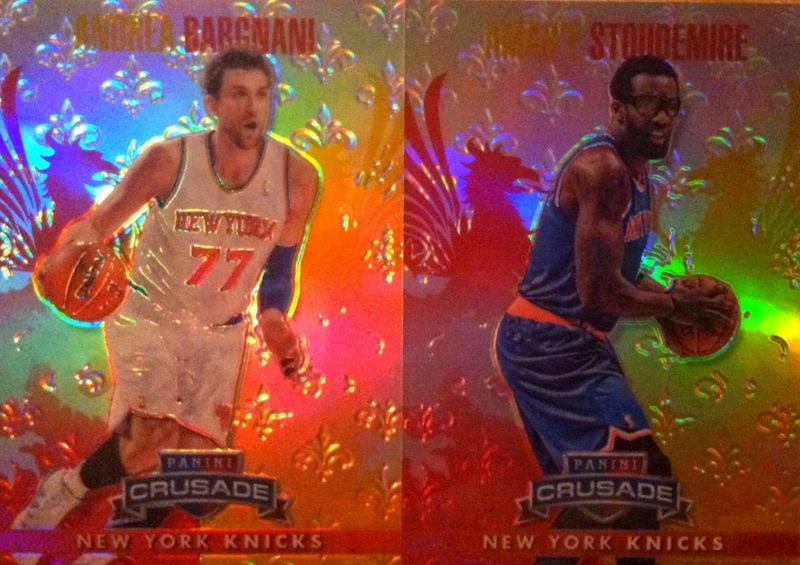 The base cards use a dark colored photo making it look throwback against the rainbow foil border. In person, these look really impressive. 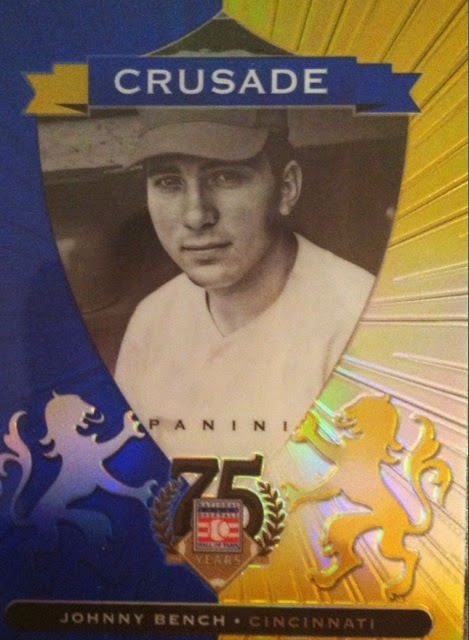 The inserts below bring back classic favorites from Donruss such as Diamond Kings, The Elite Series, Elite Dominator and the beautiful Crusade. Diamond Kings returns with cards printed on Canvas Cardstock and with 5 different levels of parallels as well, a red one above, numbered to 75 or less. The Elite Dominator and The Elite Series are much more impressive in hand. They are printed with an cracked ice appeal and really stand out. Crusades includes 6 different levels of parallel awesomeness numbered to 75 or less including the one per case hit of the die-cut versions of Orange, Green, Gold and Black. Below is an orange that I found in this box. The autographs in this product are solid. 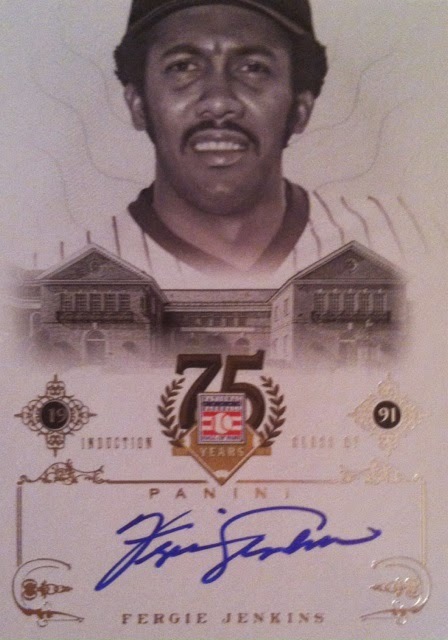 Some impressive Hall Of Famers signed on-card and also with cut signature versions. 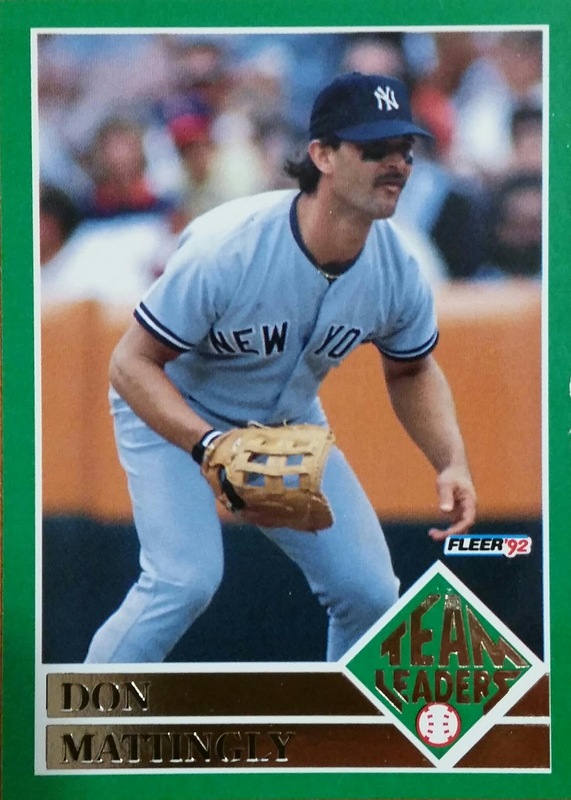 You can find names from Cal Ripken Jr. to older HOFer's such as Ty Cobb. My box didn't provide them, but I was still happy. 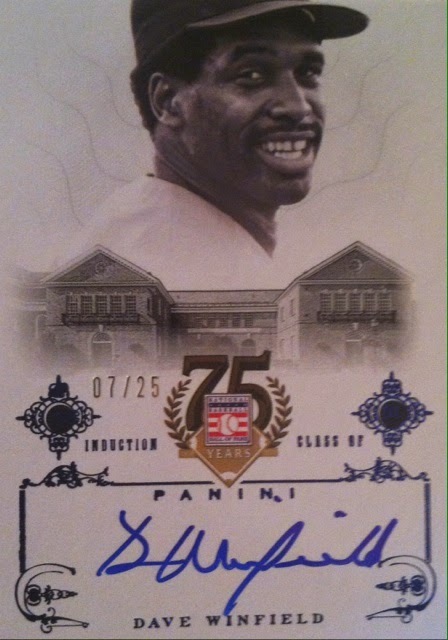 And just like with rest of the product, the autographs also have parallels numbered to 75 or less. I pulled a Winfield blue parallel numbered to 25. Overall, this product has a lot going for it. A checklist full of Hall Of Famers, some impressive inserts, low numbered cards in every box, tons of parallels, on-card autographs, cut signatures and I didn't even mention that you can pull gemstone cards including diamonds that fall one-per case. I honestly didn't know what to expect of this product, but I felt pretty happy walking away with what I got. Imagine if this product was MLB licensed. Now that would be even more amazing. Who doesn't miss these? Or miss Collector's Choice in general. It was affordable and had many fun aspects to it. 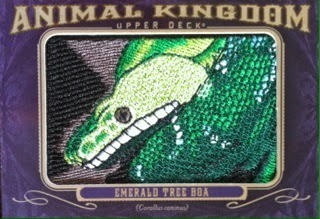 I really hope that Upper Deck thinks about bringing this back someday and hopefully showing them my favorite sticker will help! 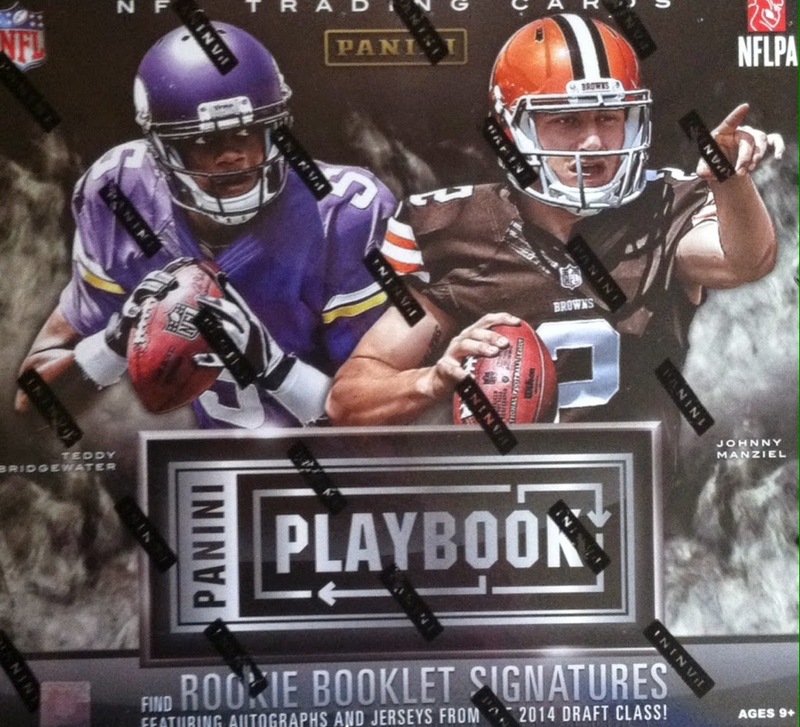 A product I have always wanted to open, Playbook returns from Panini for it's fourth time with a much different layout. In the past, Playbook came with four cards per pack/box, now, it comes with two. Both are hits, but how will this effect collectors thoughts on the product, hard to tell. However, I can give you mine and here it is. 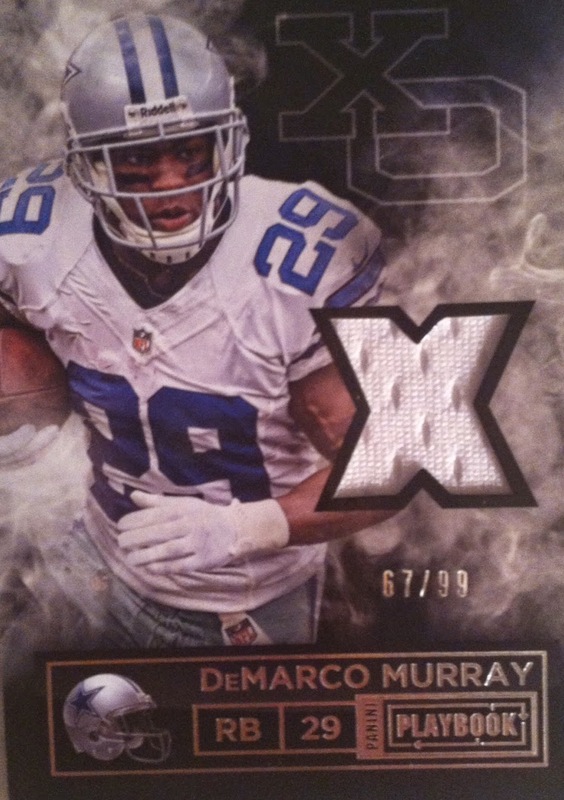 Each box of Panini Playbook Football 2014 comes with 2 cards per pack. Both are hits with at least one autograph. Each box will cost ya roughly $90 so it's a big risk with possible big return. Since this is a very small box, my review will be small as well as there is not too much to discuss. I can immediately jump right to the hits...so here we go! 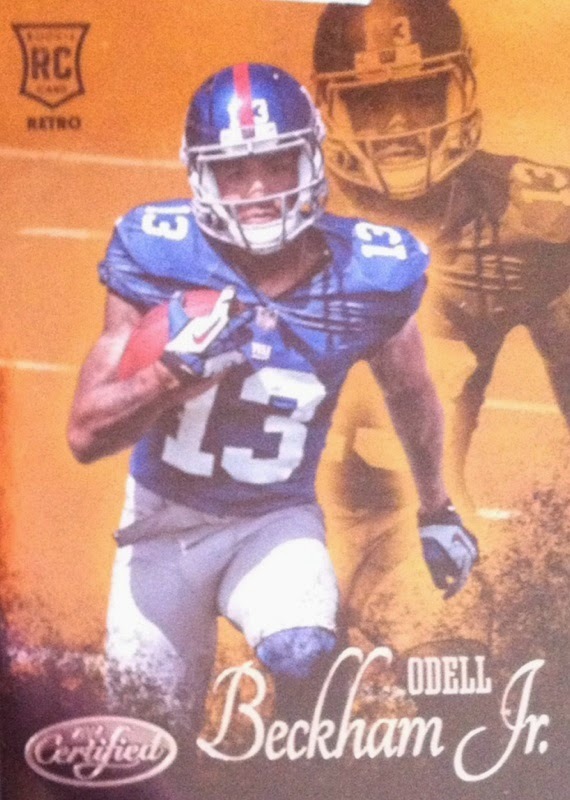 Hit number one in my pack is of the leagues top running back this season. I really like the design and layout. The swatch is a nice size as well. The second and final hit in my box was a booklet. I have seen some boxes that don't come with a booklet per and instead come with another autograph version. So landing a booklet was nice. 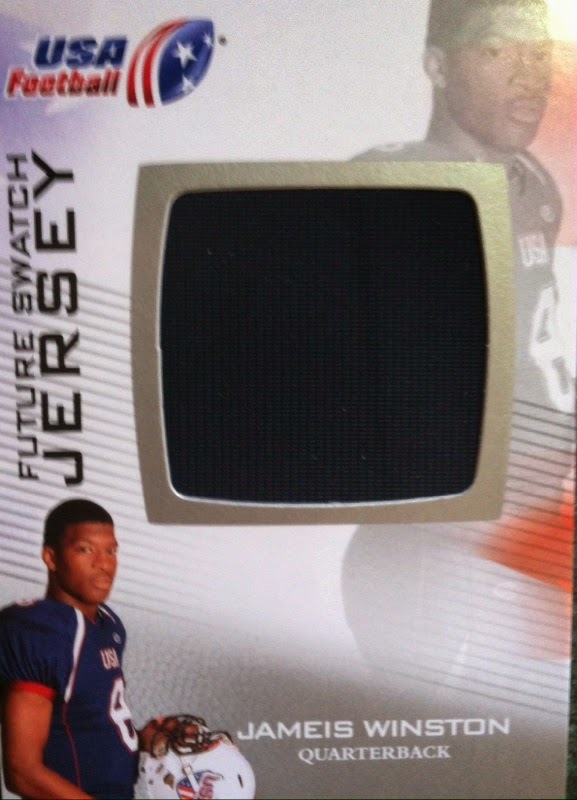 Not landing a booklet per box however seems kinda odd to me as the product is called Playbook. My booklet was of Marquis Lee. I am a huge fan of this design and layout. 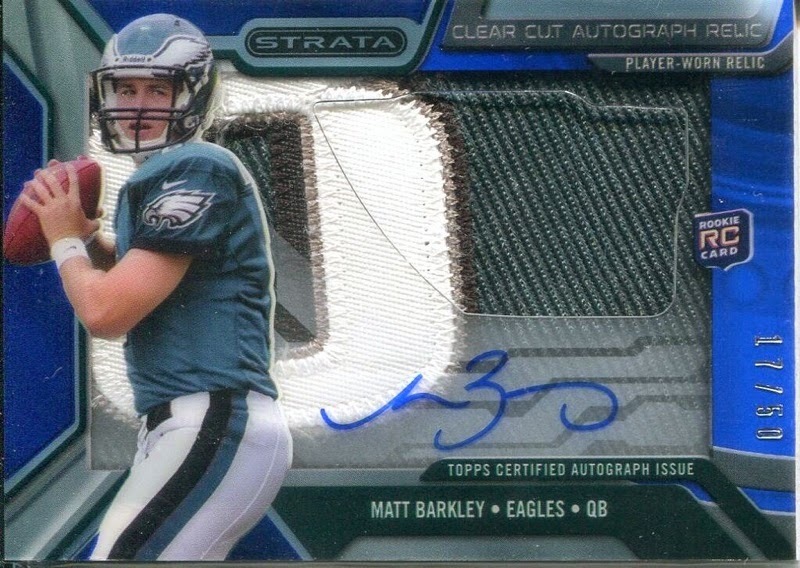 The autograph is signed on-card on acetate. 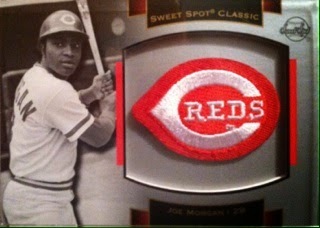 The patch is a nice 4 color swatch and there is a jersey swatch behind the player as well that is enclosed. Also on the player side is a face photo of them hidden behind acetate. Panini did a great job with these rookie auto/patch booklets. This is however only the tip of the iceberg when it comes to the booklets in this product. There are Down and Dirty versions featuring dirt and grass stains on the swatches, Armory that features six pieces of memorabilia and photos that covers the entire card and a new one in Game Of Inches which you just need to go to Panini's Knights Lance blog to check out those beauties! Your jaw will drop. Plus, you can find actual drawn out plays from a playbook done by a player, printing plates, Nike Swoosh and NFL Shield versions. So there is some tremendous stuff to find and all of it looks top notch. Overall, I am a bit worried about value per box. Other than the one I opened, I have seen quite a few breaks, a case break for example, that wasn't so great. I think the drop off in card amount may hurt the values per box as well. Not having a guaranteed booklet too may hurt as I feel they are the biggest draw to Playbook. However, with this being said, that doesn't mean that there isn't some tremendous values to be had out there in a box of Playbook. You just have to have the luck. For fun, I thought I would throw this idea out there how I would like to see Playbook be done. Have it extend to 10 packs per box, 4 cards per pack. Put in 3 hits. Have one be a auto/patch booklet, one be a memorabilia booklet card and one be a plain autograph or memorabilia card. Have this be around $100 per box. Stick with the designs like in this product as they were superb! This includes the cards in this box and the other hits as well that were previewed. If you are a high roller when it comes to boxes, I say why not give Playbook a try as there is some BIG HITS waiting to happen. If you are like me who doesn't like much risk, Playbook isn't for you. That's the easiest way I can say this. Game of Inches memorabilia booklets feature overized swatches and highlight players reaching out for the touchdown! WINNERS Of The Player Of The Day Kid's Photo Contest!! First off, I wanna say thanks to everyone who participated in this part of the promotion. The photos were amazing, the voting was hard, and seeing the smiles on the future of the hobby made me smile and I am sure others as well. The Panini panel of voters consisted were, Chris Barr, D.J. Kazmierczak, Keith Hower, Scott Prusha, Jason, Howarth, Tracy Hackler, Doug Drotman and a special guest of Ted Litvan from BCW Supplies who I used as a tiebreaker. They each submitted to me their votes by email and Twitter and here are the results. THIRD PLACE I had to take to the randomizer as all three of these guys were tied with one vote a piece. I had no more voters to go so this was the only FAIR way to decide. There was NO WAY I was gonna choose a winner myself as I felt all pictures were equal. Congrats to Little Collector (Mark DeBarge) who takes home THIRD PLACE. Winners, please email your addresses to sportcardcollectors@hotmail.com with your address with the subject line Kids Contest Winner. I will get these prizes out as soon as I can. 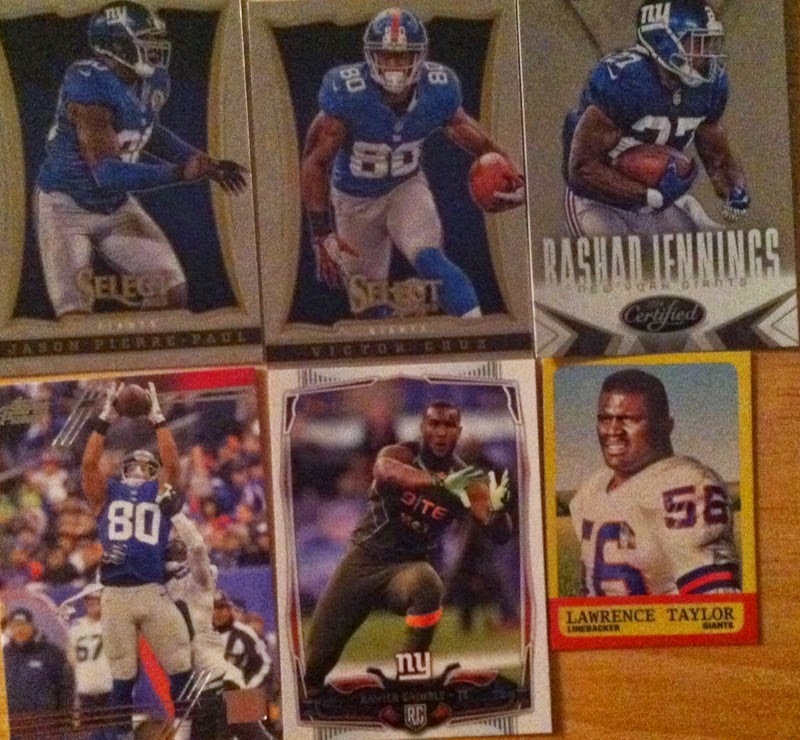 When you get these prizes, please post on Twitter or Facebook using the # #PaniniPOD. As an added twist to this contest and as part of my #SCCGivesBack promo, EVERYONE will take home a prize! So the remaining names who didn't finish in the Top 3, Troy Schweda, batcavelv, Laina Betts, Aleah Evans, Brad Jorgensen, and Mrblu1976 will take home a little something as well. Thank you for your pictures! 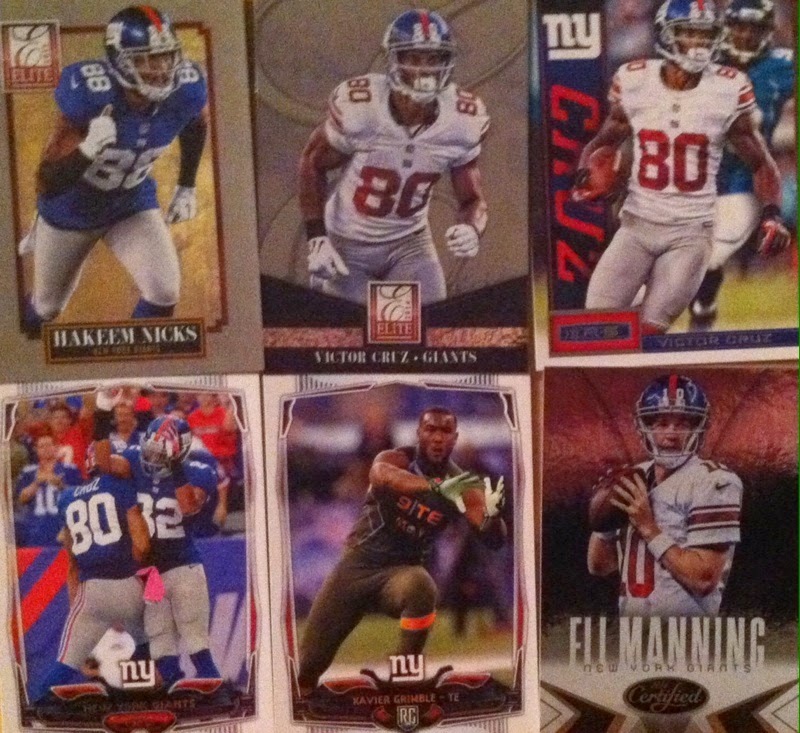 Please email me your addresses to sportcardcollectors@hotmail.com with the subject line Kids Contest Winner. I will get these prizes out to you as soon as I can! When you get the prizes, please post on Twitter or Facebook your prizes along with #SCCGivesBack and #PaniniPOD. Thanks to everyone who participated. To me, you are all big winners for collecting with your kids. Not one picture was above the rest as they all sent a meaning to the world, collecting will live on! What's In The Mail Box? Flair Set Needs, BONUS G-MEN!! 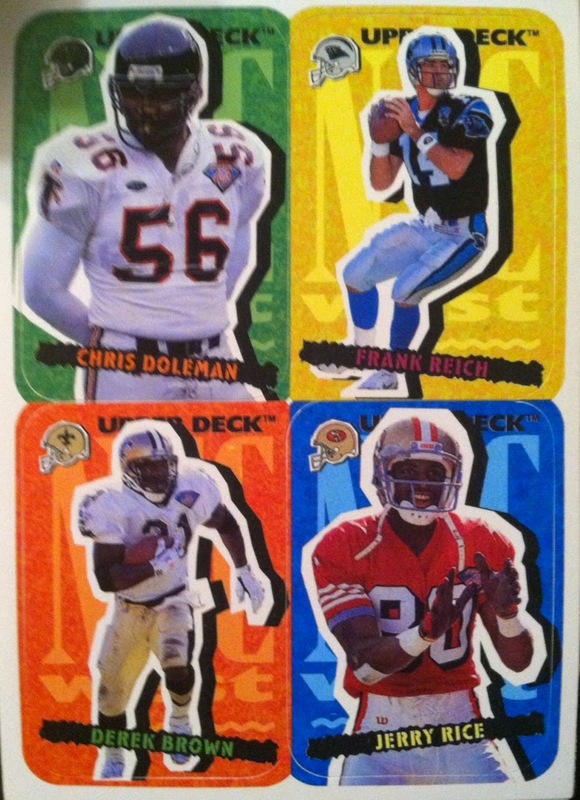 First off, let me show off three more cards to my Flair Football 2014 set that I needed. Three more down, more to go. If you have some Flair and see numbers on the right side of the blog that may help, please let me know! The missing set numbers are officially all updated! 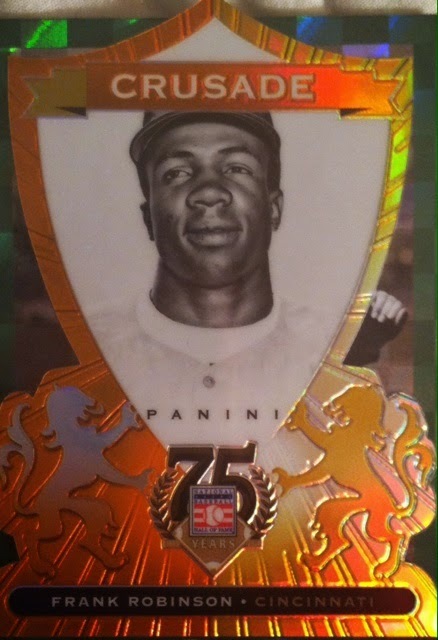 I know a lot complained about these parallels, but I am sorry, they are pretty stinking cool to me! Especially when they are Giants! A big thanks goes out to Turk for this mail day. I hope my mail day to you gets there soon and that you enjoy it as much as I enjoyed mine! Thoughts on my mail day are always encouraged! 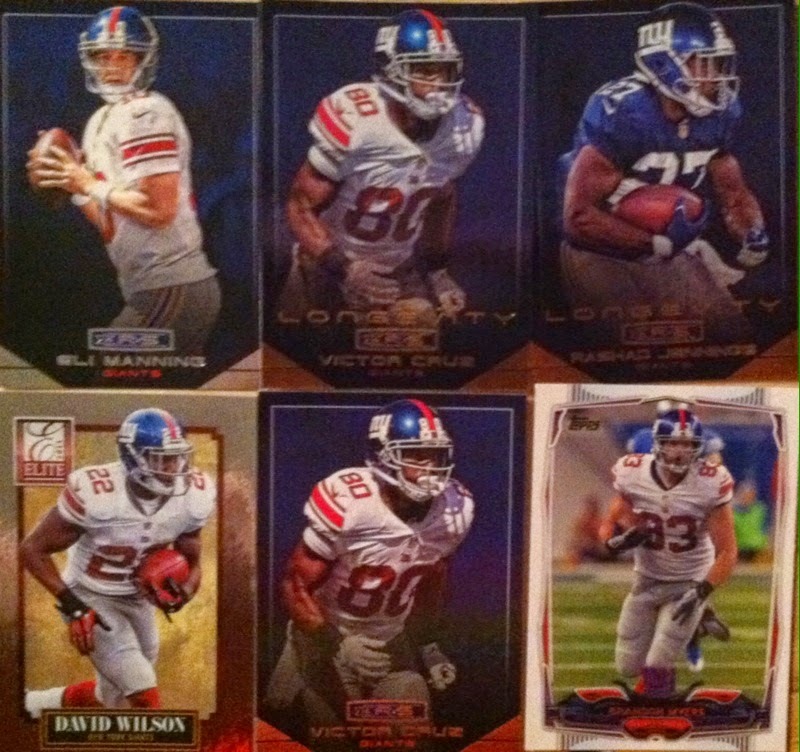 Labels: 2014, Flair Showcase, NY Giants, What's In The Mail Box? What's In The Mail Box? A Little Bit Of Everything! 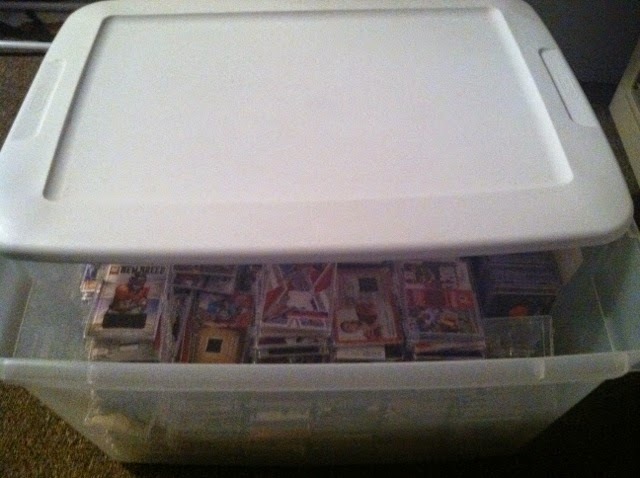 I have mentioned this before, but the internet has provided me the chance to meet some great fellow collectors and on the Sport Card Collectors Facebook page there are many of them. One in particular is Grady Malachowski. This guy not only interacts on Facebook and my blog all of the time, but once in awhile he sends me an awesome care package. A few days ago I received one of them and was excited and surprised to see it. I didn't even wait to get home to open it. Another one of those "gotta rip open in the car deals." In the package was a variety of my favorite teams, players and products I like. I can tell that Grady pays close attention to my blog and what I collect. A few new Randle PC adds! My favorite team and favorite product, Crusade looks beautiful! 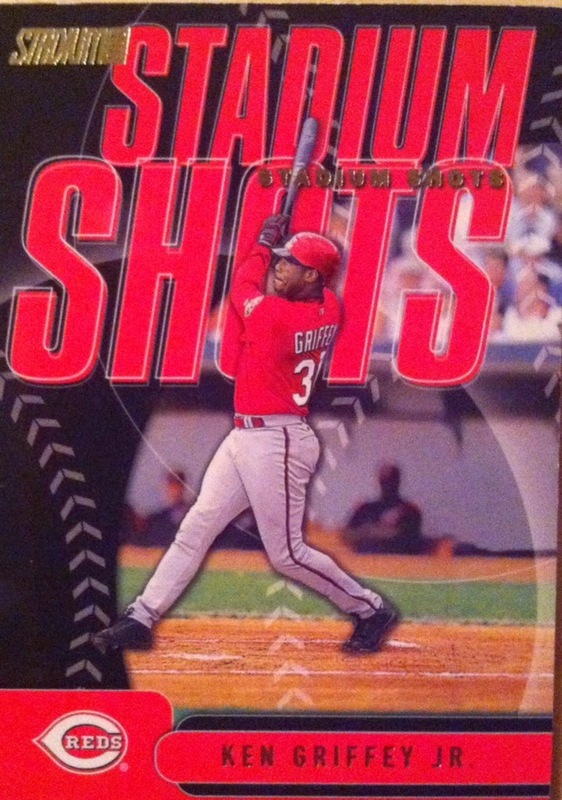 Then two NEW Griffey adds! Totally digging these! In the end, this was one nice whopping surprise mail day! 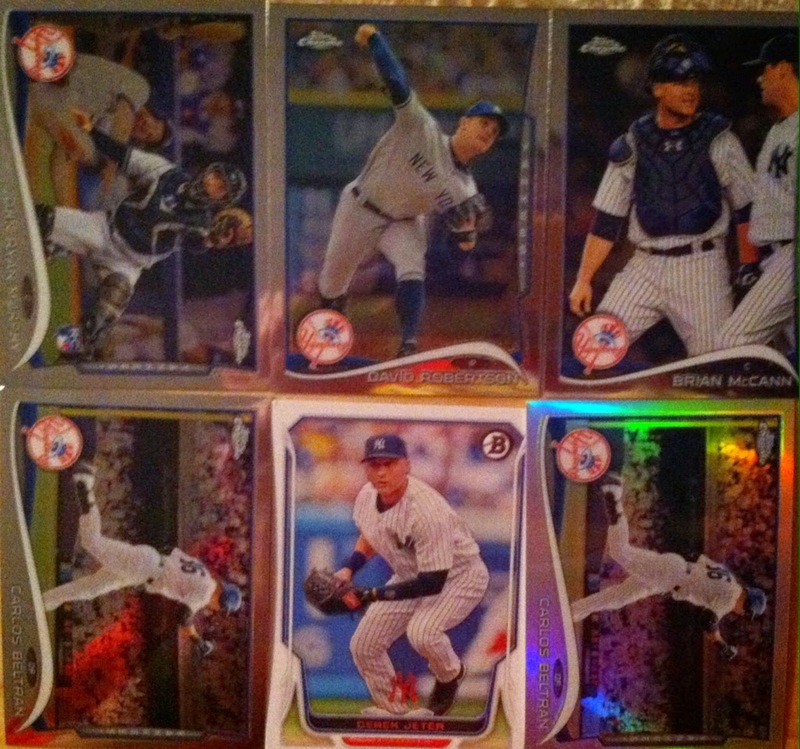 I would like to say thanks to Grady for the mail day and I appreciate all of the cards. They will make great adds to my PC. 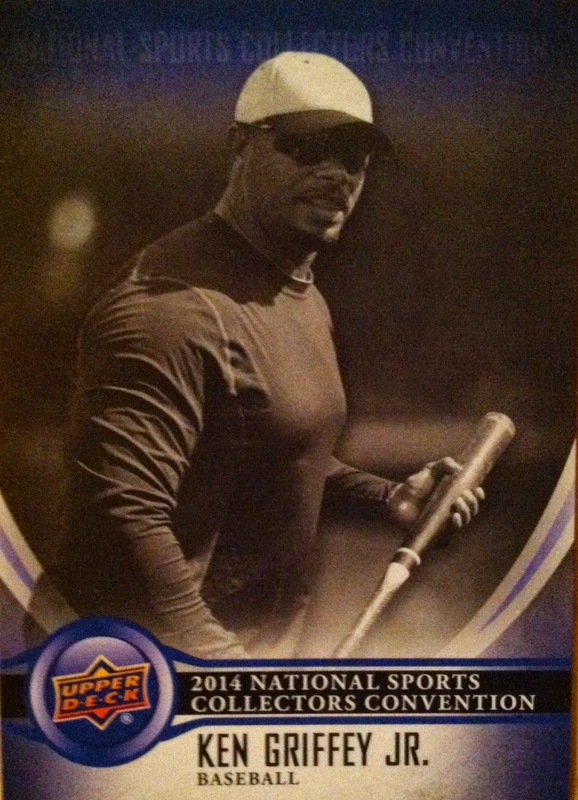 Labels: 2014, Ken Griffey Jr., NY Giants, NY Yankees, What's In The Mail Box? This is a fun card...let's put a caption on it! There's my caption, let's hear yours! Keep it clean and no language please! A decent turnout for what is one of the final three contests I will be running with The Pack Gambler as he is taking an absence from the hobby for awhile. It is always sad when a good guy leaves, but sometimes circumstances pop up where you have to make the tough decisions. So let's get to something a bit more positive, the winner. There were a few of you that chose San Fran to win but only one was close to the total score of 15. Congrats to Tony Ragsdale who chose San Fran and had the closest total score with his pick of 12. Thanks to all that participated and to The Pack Gambler for providing the prizes. Congrats again to the winner and remember if you didn't win, still a couple more Pack Gambler contests to come along with the others I am running right now. You can find those contests on the right side of the blog. Good luck to all on future contests! ITG is a company I have never opened a box of product from, but recently I was given this opportunity by winning a contest from Steel City Collectibles on Twitter. Each hobby box of 2013-14 In The Game Between The Pipes Hockey comes with 18 packs and 9 cards per pack. 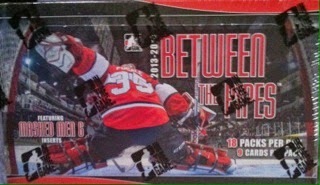 Boxes roughly run for $40 with 4 hits.This product is goalies only as the product title states. Here is what the base cards look like. There are three types, Greats Of The Game, Regular and Stars Of The Game. The design and card stock are okay. Nothing overly exciting. Inserts.... Really like the look of these. These are really cool. The Masked Men are chromed. You know how much I love Chrome and especially well done Chrome. 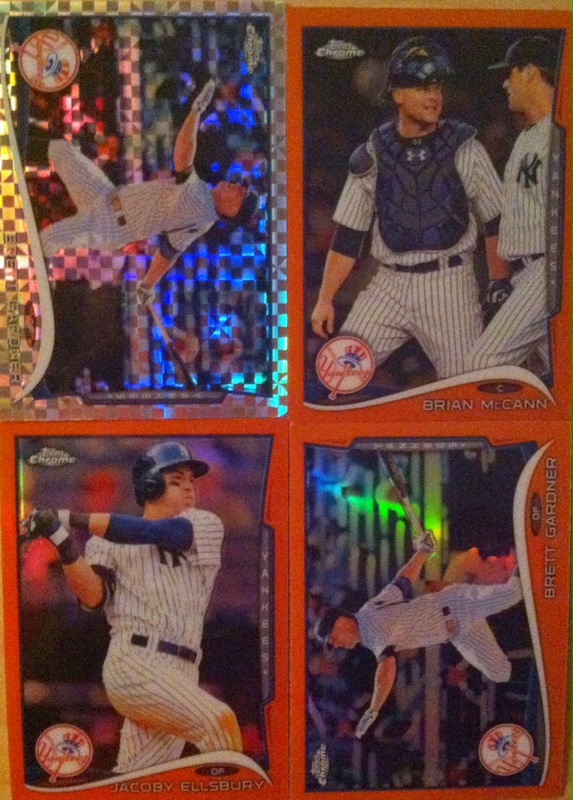 Refractor parallels need to be done! Game Used jersey cards! You don't find those too often anymore in a hobby loaded with event worn. Pulled a nice Hasek as my top hit.The designs are okay, the impressive part is the decent swatch size. My first break of ITG wasn't bad. Got an extra hit and I guess you can't argue with that. Wasn't anything big or anything that really jumped out but I did like the Hasek. I guess to me a goalies only product isn't a hit. I know being a goalie is the most important position and toughest one on the ice, but it just doesn't have that collecting appeal as opening an all position product would and landing for an example, a Sidney Crosby. A goalies only product is sort of like making a football product all of offensive and defensive lineman. Not exciting, despite respecting the position. I would like to say thanks to SCC for the box and the contest as well. They have great deals on products and run many promotions as well. Let me know your thoughts on my break and if you have broken any. Just wanted to say that Sport Card Collectors reached yet another milestone today, the big 300,000. This means that Sport Card Collectors has been viewed 300,000 times (plus by the time this publishes). Today's Topic: With Halloween just around the corner, have you ever given out cards for Trick Or Treaters? Have you ever dressed up as your favorite card, card box or used cards as part of a costume? Shiny. Micro-etched. Parallels. Everything about Black Diamond I enjoyed. I think my favorite part about Black Diamond was chasing the Diamond Parallels in packs. This particular card is just a base with a single diamond. 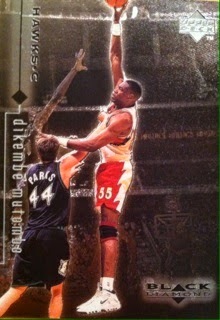 You can tell this by the one diamond above Dikembe on the left side. The chase for these parallels goes all the way up to quad diamonds. Each level of diamonds also had a different color of etching so it was never too hard to spot in packs when you had pulled one. Especially a bigger one such as gold or emerald for triple and quad diamonds. Every year since 1996, I have chased down Topps Chrome. I don't know what it is about the product, but I just love it. This year I was a big more intrigued by the baseball version than most years due to Jose Abreu. You will catch onto this with my many breaks of it. For the third time I broke a rack pack. Each rack, or what Topps now calls "value pack", comes with 3 Topps Chrome packs and one bonus pack that has 3 Orange refractor parallels. These packs run you about $10. Refractors and X-Factors. I always wonder what pitchers are saying behind their gloves. "Hey, sup. So you wanna come over Friday and play some PS3?" And a little boom. Despite his failure in the playoffs, he is still the leagues top pitcher. This is a tough Sepia Refractor pull coming in at 1:105. Overall, I can't argue with Chrome. Value is found here once again. I definitely feel like I got my money back. If not in card value, at least in the cards themselves. 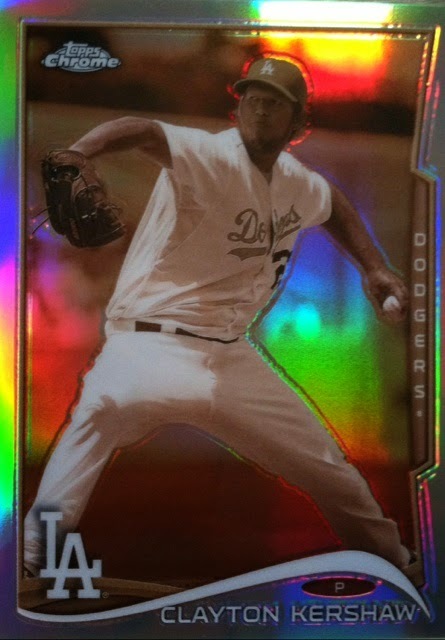 Topps Chrome once again proves to be the hobby's bright spot in retail. Winner Of Every Boy Needs A HERO DVD Giveaway! CONTEST! World Series Game 4!